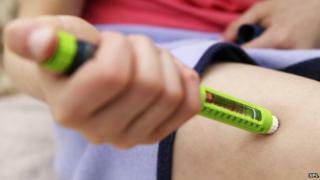 The hunt for a cure for type 1 diabetes has recently taken a "tremendous step forward", scientists have said. Tests on mice showed the cells could treat the disease, which experts described as "potentially a major medical breakthrough". But the body's own immune system can turn against the beta cells, destroying them and leaving people with a potentially fatal disease because they cannot regulate their blood sugar levels. It is different to the far more common type 2 diabetes which is largely due to an unhealthy lifestyle. The team at Harvard was led by Prof Doug Melton who began the search for a cure when his son was diagnosed 23 years ago. He then had a daughter who also developed type 1. Dr Melton said: "It was gratifying to know that we could do something that we always thought was possible. "We are now just one pre-clinical step away from the finish line." However, his children were not quite so impressed: "I think, like all kids, they always assumed that if I said I'd do this, I'd do it." Sarah Johnson, from the charity JDRF which funded the study, told the BBC: "This isn't a cure, it is a great move along the path. It is a tremendous step forward. "Replacing the cells that produce insulin as well as turning off the immune response that causes type 1 diabetes is the long-term goal." Prof Chris Mason, a stem cell scientist at University College London, said: "A scientific breakthrough is to make functional cells that cure a diabetic mouse, but a major medical breakthrough is to be able to manufacture at large enough scale the functional cells to treat all diabetics. "This research is therefore a scientific and potentially a major medical breakthrough. "If this scalable technology is proven to work in both the clinic and in the manufacturing facility, the impact on the treatment of diabetes will be a medical game-changer on a par with antibiotics and bacterial infections." Dr Gillian Morrison, from the University of Edinburgh, agreed that this "represents a real advance in the field". She said: "The next important challenge will be to find ways to maintain these cells inside the body so they are protected from the immune response and have long-term function."